A few years ago, I thought it would be nice to go dog-walking with other Bulldogs and Bulldog owners. 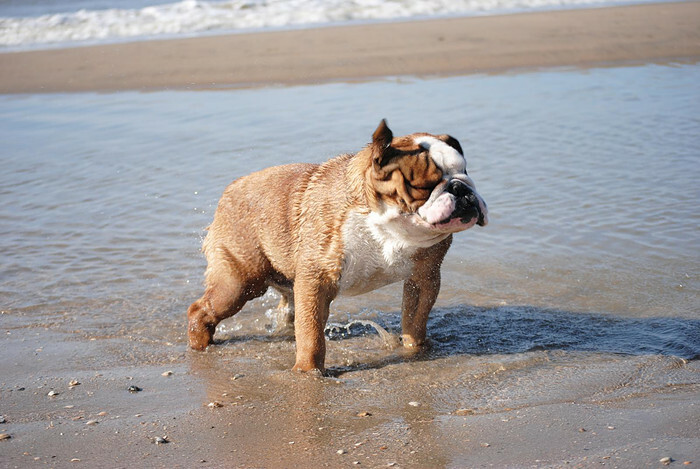 So I invited people online to come for a Bulldog walk on the beach. I hoped that maybe a few Bulldogs and owners would show up, but wasn’t really sure if anyone would respond to the invite. As I approached the beach it was literally full of Bulldogs! I think there were about 50 to 70 Bulldogs and twice as many Bulldogs owners. I was totally shocked by the amount of people and dogs and totally not prepared for such a big crowd. Thankfully it was a huge success! A day of Bulldogs wobbling through the dunes, running on the beach, dipping and diving in the sea, owners comparing and talking about their dogs and at the end all, the dogs and owners enjoying the sunset on the terrace. Ever since that 1st Bulldog Beach Walk , I was hooked and I’ve been organizing these Walks now for several years! We have at least one Walk a year and a couple of times we have also had a Winter Walk! It always takes a lot of preparation and time to organize these walks; sending invitations, making reservations, exploring new routes, finding help with photography, video and crowd control … but all the time and effort is totally worth it. Every year there are more people coming! There are now even people coming from other countries to attend the walk! Want to join one of our Beach Walks?